Form of exercise consisting of pedaling on a special exercise bike (Aquabike) immersed in water. 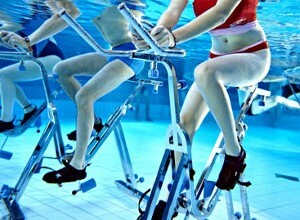 Aquacycling combines the elements of aquaerobics and exercise on a stationary bike. Water is reducing the load on the joints during pedaling and increases resistance, thanks to which muscles have to work harder. These features make aquacycling recommended for people who want to shape their body. Hydromassage improves mood, stimulates and energizes, helps maintain good form and young look. Works beneficial for the skin, removes fatigue and relaxes. Water massage also relieves joint pain, headache, relaxes tense muscles. Everyone can benefit from water massages, including children and elderly people. Especially those who work in the sitting or standing position for many hours, which badly affects the spine and circulation. Water massage soothes aching joints and assists in treatment of sciatica. Air massage can be a great fun for children, while helping to get a better and more peaceful sleep. It improves the appearance and condition of the skin and firmness of the whole body. Water massage brings relief after strenuous exercise, improves concentration and treatment of diseases of the skeletal and circulatory system. The combination of water and air allows you to intensify the beneficial properties of hydrotherapy. It is excellent in cosmetics. Improves blood circulation, accelerates fat burning, reducing cellulite. It restores the elasticity of the abdominal muscles after childbirth. Bathing in hot tubs is also recommended for skin problems, osteoporosis and digestive disorders. Hydrotherapy is one of the treatments used widely today. This method for health and relaxation is known for ages. With warm water and its movement, blood in the body begins to circulate more and endorphins are triggered in the brain canceling out pain. Hydrotherapy positively affects the joints, muscles and ligaments. Faster blood circulation also causes intense transport of oxygen and nutrients in the body. Hydrotherapy has a beneficial effect on virtually all body systems: muscular, nervous, skeletal, circulatory. 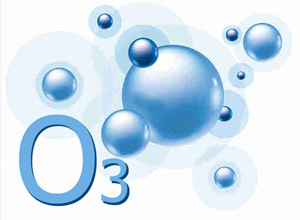 Bathing involves massaging the body submerged in the water with a huge amount of air bubbles with the addition of ozone. It has a strong relaxing and anti-depressant effect. Ozone is antibacterial and antifungal. It prevents from respiratory diseases and metabolic disorders. 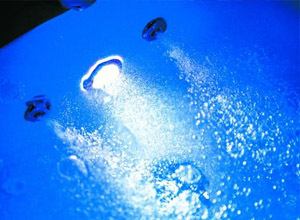 Ozone bath cleanses the skin, increasing blood circulation and stimulates the nervous system. IR irradiation of the skin results produces heat and causes sweating. It has the properties of biostimulation and health, hence its use for muscle pain, treatment of injury and inflammation and shallow circulation disorders. With it, you can cure diseases such as skin diseases, muscles, sciatica, high blood pressure, stress, fatigue, rheumatism, headache, arthritis, insomnia, colds. Infrared energy is beneficial for the cardiovascular system, the respiratory system, water and electrolyte balance, secretory function of the kidneys and many other glands. Besides, reduces muscle tension, reduces neuronal excitability and sensitivity of the receptor, which acts calming and analgesic, and greatly speeds up the metabolism. 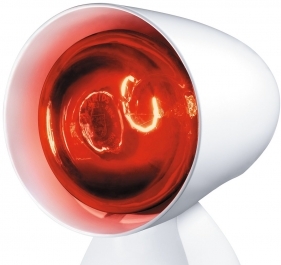 Infrared radiation cleanses the skin and subcutaneous tissues of toxins, including cellulite. Using infrared not only acts on the skin medically, but also supports weight loss. Giving the textbook of Medical Physiology Guyton producing one gram of sweat requires 0.586 kcal. A moderately conditioned person can easily sweat off 500 g in a sauna, consuming nearly 300 kcal, which is the equivalent of running 4 km. It has been proven that it is possible to stimulate the cells in skin that produce collagen fibers necessary to improve skin texture. This process occurs in the walls of small blood vessels and is stimulated by light waves of special length. Stimulation of cells for collagen production improves the ability of the skin to collect the oxygen and its ability to excrete toxins. Skin's ability to collect and store water gets significantly improved. This process improves the firmness of the skin and has a positive influence on regeneration, which strengthens the structure of collagen. That way we're able to remodel a structure of skin. Importantly, collagen helps to produce new, healthy skin and speeds up wound healing. Vacuum during workout improves blood circulation in the skin and subcutaneous tissue in problematic areas like thighs, buttocks, the waist. Fats are energy carriers needed for skeletal muscle to work. During exercise, the vacuum reaches the high free fatty acid release from adipose tissue and accelerates transporting them into the muscle tissue by increasing the blood circulation. Vacuum improves lymph circulation, responsible for removal of metabolic waste products and excess water. The result is smooth and firm skin and quick reduction of body fat. It works by stimulating sites that are responsible for proper body functions such as energy centers (chakras), roads and energy points (meridians, meridians), and the zone of pulses and organs. Blue - calms, inhibits, focuses, cools, stores energy, leads to the order of overactive inflammation, calms. In terms of the impact of blue is the opposite of red. Yellow - strengthens, tones, opens, enlivens the mind, stimulates, but not angry, expanding the field of action of energy, strengthens the weak processes of the body, eliminates numbness, strengthens the nervous Immunity. In terms of the impact of yellow is situated exactly between red and blue. Green - restores the balance, relaxes, soothes, maintains physical energy and mental equilibrium, eliminates tension and pain, gives a deep peace. In terms of the impact of green is intermediate between blue and yellow. Orange - restores, revives, warms, stimulates energy milder than red and calmly it regenerates, eliminates cramps. In terms of the impact of orange is intermediate between red and yellow. Purple - inspires, soothes nerves, reduces nervousness, increases the level of transformation of energy, supports mental effort, relaxes, soothes irritated nerves, relieves pain. In terms of the impact of purple combines the effects of blue and red.